Pretty sure this is the first episode Megan appears in. The whole deal with Allison has to be one of Don's low points. Christmas Comes but Once a Year: Harry eats cookies. Carla answers the phone. Peggy gives Mark a hand. I'm posting the episodes but I'm still two or three behind. And I want to play the Episode Description Game! The great thing about the Episode Description Game is you don't have to watch the episode! The people writing them officially sure haven't. Don drinks. Roger drinks. Bert says something profound. Don drinks. Lee Garner (after Roger hands him a gift): You didn't have to do that. I could watch this joke on repeat. I didn't realise Jane decorated Roger's office. I always loved it but couldn't see how Roger would have chosen something so different to his personality. Now it all becomes clear. Episode description: Roger is Santa. Bert's a racist. Don drinks Freddie's share of the alcohol. Also, I think the lesson Freddie Rumsen taught us in this episode is that alcohol is a lot easier to give up than misogyny. His interactions with Peggy were really annoying. I mean, I know everyone is basically like that in the show, but there was something about the way he interacted with her that seemed especially galling. Maybe it's just because I expected better from him for some reason. On the flip side, Don's "Merry Christmas, sweetheart," to Peggy could have sounded really condescending, but for some reason it struck me as actually kind of sincere. Oh, and there was a lot of interesting foreshadowing for season 6 and 7 in this episode. I remembered the return of Freddie and his "fraternity," but I forgot how that was juxtaposed with Don's out of control drinking. Also, I think the lesson Freddie Rumsen taught us in this episode is that alcohol is a lot easier to give up than misogyny. Yeah, Freddy really stands out as an anachronism, both in personal outlook and dress, in the new offices of SCDP. Darren Pettie is always convincing as the odious Lee Garner, Jr.
Oh, and there was a lot of interesting foreshadowing for season 6 and 7 in this episode. It's amazing how good Mad Men is about dropping hints about the future. In this episode, we have Megan showing up at the same time Don is so out of it that he's drunkenly putting the moves on his secretary. 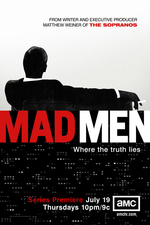 The advertising agency that bought Sterling Cooper last season, forcing them to start the new agency is the same one that they sell to at the end of season 7. %n: "Pretty sure this is the first episode Megan appears in." I have to rant for a moment. My real name is Megan. I speak French as a second language and I've traveled extensively in France. My husband is French-Canadian; French is his first language. His parents speak passable English but generally they speak French at home. I have visited Quebec semi-regularly since the late 1980s. No French speaker I have ever known has been able to manage my name the first time. I have to spell it nearly every time. It's easier now than it used to be (thanks, Renault!) but it is very unlikely that her French-Canadian parents would have named her Megan. This is why I suspect Megan-the-character was introduced and they retconned her to be French-Canadian.